The days are getting shorter and our sunsets are looking more dramatic with each passing day. I am starting my first post of November with this extra special cake. Special because I don’t use pistachios and rose petals often. It’s easier to get the roasted and salted pistachios than the shelled ones. So during my husband’s recent trip to Kolkata he got some for me. The inspiration for this cake came from an in-flight magazine that I had leafed through on our recent holiday. I remember the cake had almond meal and Greek yogurt mixed into the batter. But I made certain adaptations and loved the way it turned out. Blitz the pistachios and set aside. Preheat the oven at 170 C and grease the cake tin. Cut a disc of grease proof paper and line the bottom of the tin. Cream the butter and the sugar till it turns fluffy and pale. Beat in one egg and beat till it’s well incorporated into the mix. Repeat with the other two eggs. Add the milk and whisk. Add the ground pistachios and cardamoms. Mix. Lastly fold in the flour and baking powder. Pour the batter into the prepared tin, give it a few taps on your work surface to remove any air bubbles, and bake for about 40-45 minutes. If the top tends to brown easily, place a piece of foil on the surface. A skewer inserted in the centre should come out clean. Prepare the syrup by heating up the sugar and the water. Cook till the sugar melts. Set aside and let the syrup cool down a bit. Take a skewer and make insertions all across the surface of the cake. Pour the cooled syrup on the still-warm cake. 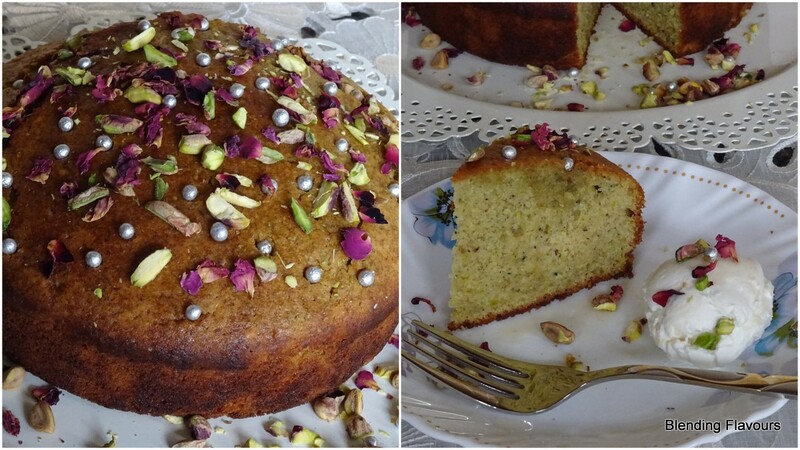 Scatter the chopped pistachios and rose petals across the top. To serve, place a scoop ( I used an ice cream scoop) of strained yogurt on a plate and a slice of cake. If you like you could put a few embellishments on the yogurt too. I used very little syrup for this cake as I don’t like anything that’s overly sweet. I added the olive oil thinking it would make a little difference in the colour 🙂 but I don’t think it did! I find cardamom quite over-powering so I used only 2 pods. It turned out to be just right.